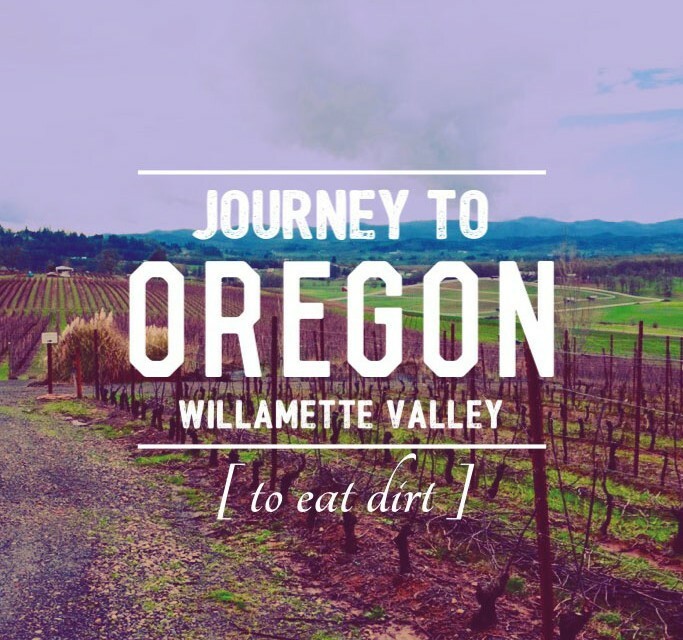 I received an invite to a dinner called “Eat Dirt” from winemaker Nicholas Keeler, Authentique Wines, based in the Eola-Amity AVA of Oregon’s Willamette Valley. 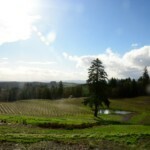 Because I had never been to Oregon wine country (guilty as charged!) and because Oregon is a major component of our American Wine Studies program, I took him up on the offer to visit the surrounding wine trails. 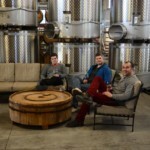 Along for the ride was Josh Phelps, proprietor of Taken Wine Co, Barrett Corrigan of Cakebread Cellars, and friend and enthusiast J.B. Mitchell. Stopping through the town of Yamhil — we saw lots of hazelnut tree farms. Most everyone used to grow hazelnut trees there. 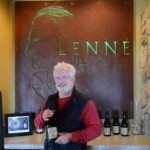 We visited Lenne Estate in the Yamhil-Carlton AVA right near Dundee Hills AVA and near Chehalam Mountain AVA. 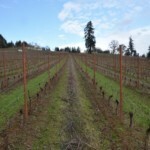 A 20-acre estate site with 15.5 acres planted mostly to Pinot and Chardonnay. Clones: 114, 115, 667, Pommard. Soil: Peavine soil — sedimentary and gravelly with clay loam. 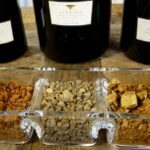 Then, off to the Dundee Hills AVA at to visit Alexana Winery. With 56 acres planted to vine they have 10 different Pinot clones planted around 350-850 feet above sea level and have categorized 18 different soil types. Side note: they make an Argentine Malbec with consulting winemaker Santiago Achával. 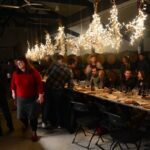 And eventually, we made out way to the Keeler Estate Vineyard in Amity, to “Eat Dirt” with Nicholas Keeler and his co-collaborator, performance artists Betsy Hinze. We started out with Keeler’s Authentique 2011 Pinot Noir, Eola-Amity Hills AVA, which was his first vintage. 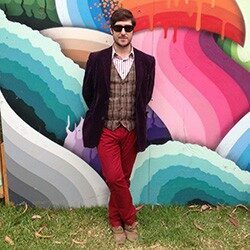 It was all raspberry, cherry, earthy, funky, spicy and full bodied from there. Hope you enjoy the slideshow. Rob Hangauer, a friend of a friend, retiree working at Lenne Estate in the town of Yamhill, Oregon, in the Yamhill-Carlton District, toured. 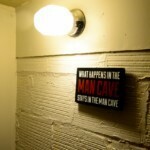 This is Rob’s sign on the way down to his personal cellar. 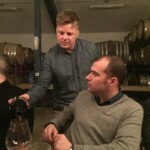 Ladies and Gents: Rob Hangauer — Rob treated us to a tasting of Lenne Estates dazzling lineup of Pinots from Pommard Clones, Clone 114, 115, and many others. 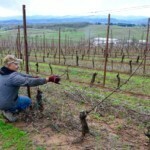 A vineyard manager, pruning at Lenne. These are south-facing slopes, all Pinot. Same vineyard at Lenne Estate, facing North. Next stop was at Alexana Winery, owned by Dr. Madaiah Revana. View from Alexana’s tasting room terrace. Winemaker Lynn Penner-Ash started her career as an enologist at Stag’s Leap Wine Cellars. L to R: J.B. Mitchell, wine enthusiast from St. Helena, CA; Barrett Corrigan, Cakebread Cellars; Josh Phelps, Proprietor, Taken Wine Co. — part of my entourage for this trip. 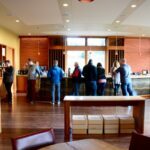 The tasting room at Alexana. 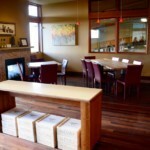 Reverse view of the tasting room at Alexana. 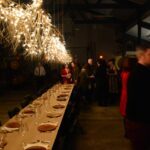 Our primary reason for visiting Willamette Valley was to “eat dirt” an experiential dinner concept by Nicholas Keeler, Authentique Wines and performance artists Betsy Hinze. 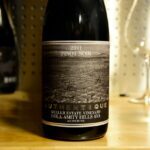 This 2011 Eola-Amity Hills Pinot was one highlight out of many from Authentique. Betsy Hinze, red dress, at the end of this fabulously elegant setup. Those are tumble-weeds and plates she made specifically for this dinner. Okay, so we didn’t actually eat dirt. 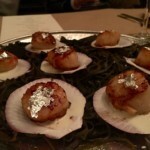 But, the ingredients and presentation were all designed to mimic the elements of “terroir.” Here, scallops are dusted with juniper, flaked with silver-leaf, on a bed of elderberry cream. 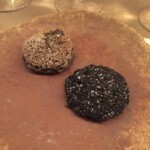 This was paired with Authentique Chardonnay. Actually, it was craftily disguised beets. Beets and goat cheese and the top right is a raspberry paste of sorts. 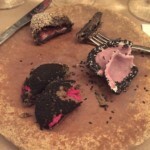 Bringing Authentique Pinots served with this course to a whole new level of understanding. Winemaker Nichola Keeler, Authentique, pouring for Josh Phelps, Taken Wine Co.
Center: a potato. 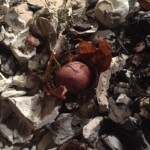 That I discovered after cracking open a ball of baked clay. 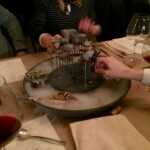 This was an interactive course of root vegetables. All were wrapped in leaves and pine, then ensconced in clay, baked, and opened with the aide of a hammer by all guests in attendance. We worked for a meal! Stones on sticks? Swamp food? Actually, it was slices of pear, dusted or painted gray (hopefully with something edible and organic).